Being stuck without a home is one of the more inconvenient situations your family can face. If you’re lucky, you might have family closeby who will support you while you wait for your home to be ready. This usually means free rent, but it also means living with the in-laws who keep the thermostat at 78 degrees in the summer; or, it might mean sharing a bedroom with your three children for a few months. In terms of your furniture, you probably have to find a storage unit to house all of your items while you stay with someone else. If you don’t have a family or friend’s home as an option, you might be relegated to paying for a temporary rental property. You have to move in all of your stuff and pay someone else’s mortgage, only to move out again in a few months. So, what’s a solution to this all-too-common issue? Buying a modular home. Learn more today from Cannon Homes Inc. about the speed-related benefits of building a modular home. Modular homes require about one-third of the time that traditional, stick-built homes take. Before you assume that building a home quickly means sacrificing quality, think again. 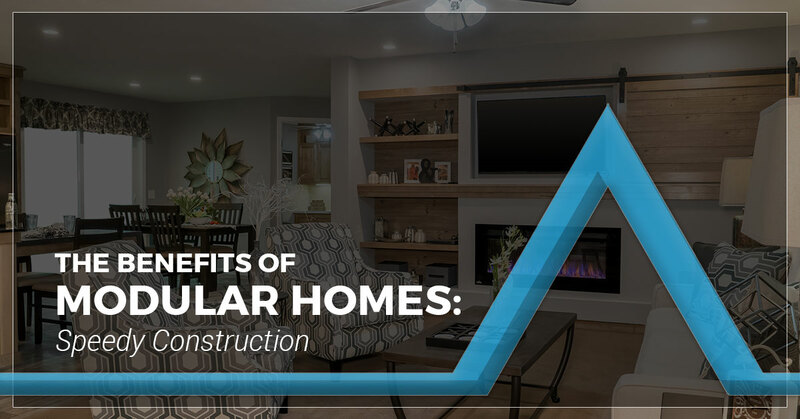 As we outlined in our “Pre-Inspections” and “Misconceptions About Modular Homes” articles, modular homes must adhere to stringent building guidelines — in fact, these guidelines are usually more strict than the ones by which traditional homes must abide. Still, even given these tight regulations, modular homes are built quickly thanks to a seamless manufacturing process. These homes benefit from economies of scale, a temperate factory environment, and a systematized process. There are no bad weather days, no rains that flood the foundation, no sun blazing so strongly that crews can’t continue working. When you build a home in a factory, therefore, it goes much more quickly. When you build a traditional, stick-built home, you can only really work on one aspect at a time. You certainly can’t shingle a roof if the foundation isn’t even poured. With modular homes, however, you can work on every part of the home at once. No part is dependent on another; instead, the mechanized process allows for everything to be constructed at once. Additionally, your modular home building team can get your site prepared as the factory team constructs the home. They can dig the foundation, set up the septic system, and ensure that all site-related maintenance is completed. If you want a modular home in Marion, Salem, Mount Vernon, or the rest of Southern Illinois, be sure to call Cannon Homes Inc. today. Within a few weeks of your call, you can have the home of your dreams.